Gather Coins is the name of a Mini Battle from Super Mario World 2: Yoshi's Island and its remake Yoshi's Island: Super Mario Advance 3. The Mini Battle involves the player competing against a Bandit to collect the most coins before time runs out. The coins themselves are shot out of a cannon moving on a track overhead. 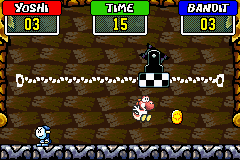 The player can stomp on the Bandit to stun it for a short while, and vice versa; running into the bandit causes both it and Yoshi to be knocked back. If Yoshi wins, the player gets a random item. Grab more coins than your enemy before the time reaches 0. This page was last edited on February 22, 2018, at 08:13.